Australia's Most Awarded Mercedes-Benz Retailer proudly presents this fantastically low kilometre 280kW Update GLA45 AMG. Stunningly presented in sparkling Mountain Grey Metallic with AMG performance seats in Black RED CUT leather upholstery riding on 20-inch AMG 10 Spoke Alloy Wheels in Matte Black, all with the assurance of 2 Years 100% Mercedes-Benz Factory-Backed Warranty & 2 Years Mercedes-Benz Roadside Assistance Applicable Australia-Wide. 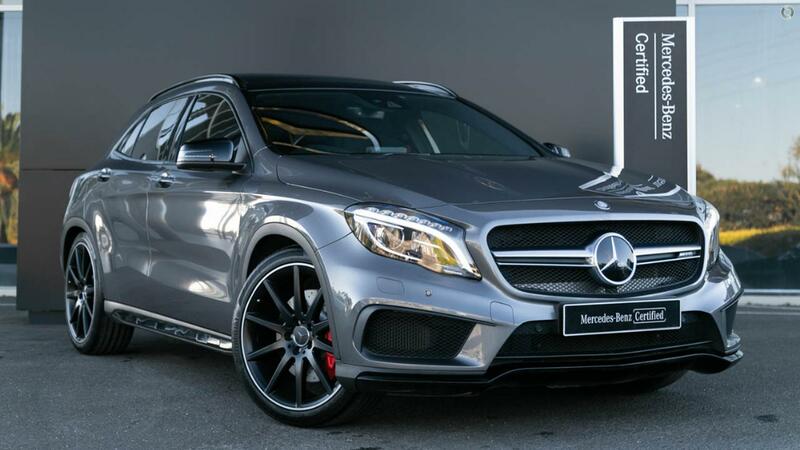 Take the wheel of your astonishing AMG GLA45 4MATIC with absolute confidence - ONLY from a Certified Mercedes-Benz expert and the reigning "Mercedes-Benz Metropolitan Retailer of the Year" again, for the 5th time in 6 years! - Upper dashboard in black ARTICO man-made leather. - "TURBO 4MATIC" badge on side. - Roof rails in aluminium.